Will the Flag Be Removed? 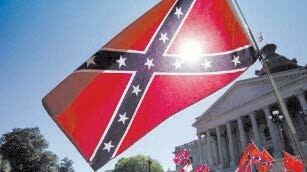 The effort by S. C. Governor Nikki Haley to remove the Confederate flag from the South Carolina statehouse grounds is gaining strong momentum. Nearly all state senators are backing it. And petitioners are collecting signatures by the hundreds of thousands. A final Senate vote of 36-3 sent the bill to the House of Representatives late Tuesday morning. “The South Carolina Senate … rose to this historic occasion, with a large majority of members from both parties coming together in the spirit of unity and healing that is binding our state back together and moving us forward in the right direction,” Gov. Nikki Haley said after a procedural vote on Monday’s afternoon. “I applaud the Senate’s decisive action … and ask that the House act swiftly and follow the Senate’s lead.” said Gov. Haley. Momentum to take down the flag quickly grew after a deadly shooting at a predominantly black church in Charleston last month.